Feline asthma is the most commonly diagnosed respiratory disease. Asthma symptoms can be similar to chronic bronchitis and even sometimes mistaken for hairballs (although hairballs can cause retching and vomiting). If your cat displays symptoms, it's important to contact your veterinarian right away. Feline asthma is a condition that results in breathing difficulty, coughing and wheezing. It is characterized by chronic inflammation of the respiratory airways that can be triggered by allergen exposure, chemical inhalants, and possibly an autoimmune response. 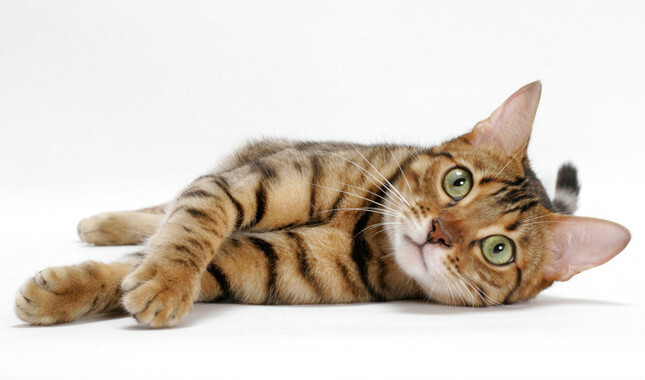 Feline asthma symptoms are distressing for pet owners to witness and hard on your kitty too. That is why it is so essential to make the lifestyle and holistic changes along with the treatments from your veterinarian in an effort to help your cat lead as normal life as possible. During an asthma attack, the passageways in your cat's lungs become inflamed and constricted making it very hard for your cat to breathe. An attack can quickly become a serious incident, so if your cat shows any signs of respiratory distress, contact your veterinarian immediately. While there isn't a cure for asthma, the symptoms can be well managed using a combination of conventional veterinary treatments and holistic care. 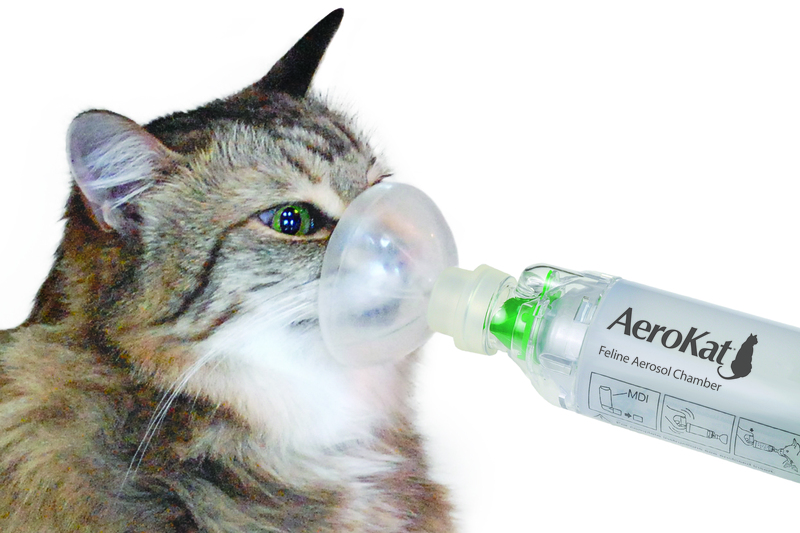 Conventional veterinary treatments for feline asthma include the use of corticosteroid drugs to reduce inflammation along with a bronchodilator to open up the air passageways. Conventional medications have side effects though, including the potential for diabetes and increased infections, so using holistic and lifestyle changes are important to help minimize the need and frequency of them. Please note that natural treatments for feline asthma are not meant to be a substitute for conventional veterinary treatments. Feline asthma is a serious condition and your veterinarian needs to be involved in the regular monitoring of your cat's symptoms and medication usage. But, using a holistic approach can slowly improve your cat's well being and over time, the frequency and severity of asthma attacks should improve reducing the need for medication. Don't allow anyone to smoke near your cat or inside your home. Second-hand smoke is a huge trigger for feline asthma. Reduce exposure to allergens such as pollen, mold and dust from cat litter. Buy an air purifier and replace filters regularly. Use natural cleaning products such as cleanser and avoid detergents with strong fragrances. Keep potential stressors to a minimum. Loud noise, excited children, house guests can be stressful for your cat. QuentaSAN Drops - A powerful anti-viral, anti-infection homeopathic remedy. These homeopathic drops are the first line of defense with any upper respiratory condition. QuentaSAN drops work best when combined with NotaSAN drops. The two formulas work synergistically to control infections and inflammation. QuentaSAN seems to be especially helpful for lung-related health issues. Many cat owners have reported excellent results relieving continual discharge, runny nose and sneezing related to viruses when QuentaSAN and NotaSAN drops were administered. NotaSAN Drops - A powerful anti-inflammatory, anti-infection formula. These homeopathic drops are especially important for relieving allergy symptoms. NotaSAN, when combined with QuentaSAN works very well to control chronic upper respiratory infections, asthma, eye and nasal discharge. The two formulas are tasteless drops that can be easily administered to cats. Silver Immune Support For Pets - Easy to use, anti-infection liquid. These nontoxic drops are safe for tiny kittens and shown in research to help reduce viral replication. By reducing infection, inflammation is reduced in the membranes, reducing mucous making it easier to breathe. Power Probiotic - This multi-strain formula can be sprinkled on food or eaten by itself (many cats like the taste of it). Power Probiotic promotes the growth of friendly bacteria which aids your cat's immune system. Why is this important? The majority of your cat's immune system resides in the the intestinal tract. Using Power Probiotic is essential if your cat has taken steroids or antibiotics as these medications reduce the population of friendly bacteria. Friendly bacteria fight off pathogens, bad bacteria and viruses in an effort to keep your cat healthy. Power Probiotic is essential for all cats but especially those diagnosed with feline asthma. Amazing Omegas - Omega 3 fatty acids can reduce symptoms and inflammation in asthma patients. Amazing Omegas is the absolute best fish oil for pets, naturally derived from sardines, mackerel and anchovies. Packed in glass bottles, it is free from toxins and PCBs. It only takes a few drops to help your kitty. One caveat is that if your cat is extremely allergic to fish, there is a possibility that fish oil could also present a problem. Generally what triggers allergies is the protein found in fish which is not present in the oil. However, if this is an issue for your kitty, then Flax Seed Oil may be the next best alternative. We all want to spoil our cats but not at the expense of making them sick. Treating your kitty with asthma is going to require some adjustments to your cat's diet. This can be challenging at first, especially in a multi-cat household. However, the recommended diet for feline asthma is most likely a better diet for all of your pets. For example, there might be one cat in the household where one has asthma, another has UTIs and still another has Inflammatory Bowel Disease (IBD) There is usually an underlying theme throughout - the diet! Most cat food diets contain ingredients that many cats are allergic to or intolerant of. This creates inflammation which can weaken your cat's overall immune system. Pets that have asthma often have food allergies and that can make their asthma symptoms worse. Food allergies in cats and food intolerances are much more common than pet owners realize. One reason is that food allergy testing even with the best of tests, isn't especially accurate. The best tests may show allergies to a few items and yes, definitely avoid those items. But if a cat hasn't been eating certain foods, those same foods might also show up as not-allergic, in other words it is a false negative. Furthermore, some foods may not trigger allergies per se, but the cat is intolerant of them or the food just isn't good for them. An example of that is starchy carbs and grains. Unless a cat needs to be on a protein-restricted diet due to kidney or liver disease, then cats need to eat their natural carnivorous diet. Vegetarian diets, treats with molasses and grains, just aren't what a cat was meant to eat. But, even if you are feeding your cat a premium grain-free diet, there still could be ingredients in the food that are problematic for your cat. As a general rule, an anti-inflammatory feline asthma diet would avoid dry food (all are made with starchy carbs), poultry, fish and grains. 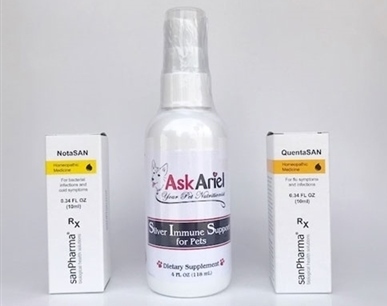 Why Use Ask Ariel Supplements To Help Your Pet With Asthma?